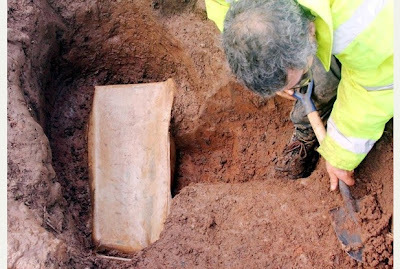 A child's coffin believed to date back to the 3rd Century AD has been found beneath a Leicestershire field by metal detectorists. The Digging Up The Past club found the lead coffin and Roman coins at a farm in the west of the county. Club spokesman David Hutchings said: "I knew it was something a bit special as soon as I saw it." 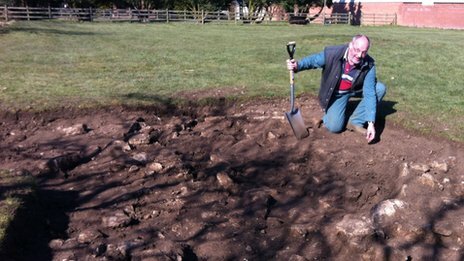 Archaeologists believe they have found another Roman building at the site of a dig in a private garden in Lincolnshire. The work in Navenby has already uncovered several buildings used as workshops in the 3rd Century. Volunteers and specialists will continue to dig for another 11 days before the site is filled back in. The project, which started in April, has also uncovered a portable altar and an offertory stone. 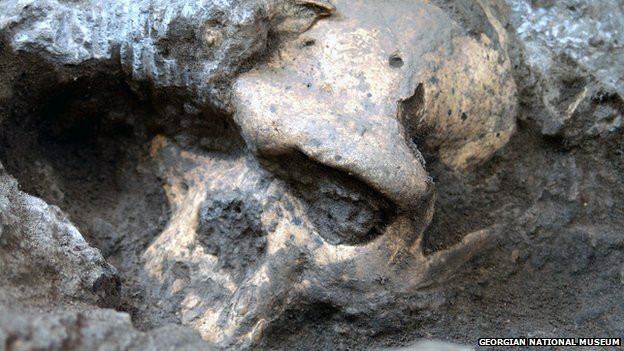 The stomach-turning truth about what the Neanderthals ate? The idea of these early humans being plant-eating, self-medicating sophisticates has been brought into question by the findings of researchers at London's Natural History Museum. It was the tell-tale tartar on the teeth that told the truth. Or at least, that is what it appeared to do. Researchers – after studying calcified plaque on Neanderthal fossil teeth found in El Sidrón cave in Spain – last year concluded that members of this extinct human species cooked vegetables and consumed bitter-tasting medicinal plants such as chamomile and yarrow. These were not brainless carnivores, in other words. These were smart and sensitive people capable of providing themselves with balanced diets and of treating themselves with health-restoring herbs, concluded the researchers, led by Karen Hardy at the Catalan Institution for Research and Advanced Studies in Barcelona. 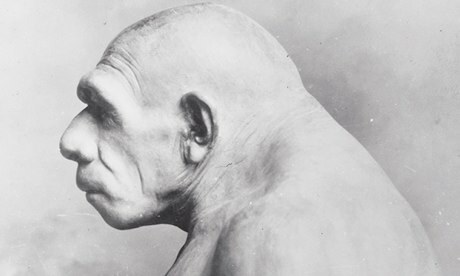 Our vision of these long-extinct people needs adjusting, they argued. 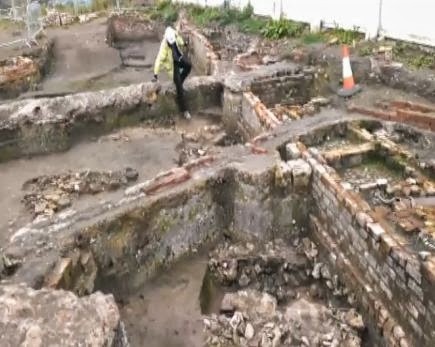 The remains of one of York's "lost" medieval churches have been revealed to the public for the first time in about 450 years. The precise location of the 12th Century St John the Baptist church in Hungate was never recorded before its demolition in the 16th Century. But York Archaeological Trust (Yat) staff, using old maps, have worked over the summer to reveal the church. Arran Johnson, from Yat, said the find was "an archaeologist's dream". Archaeologists in Sweden said Thursday they have unearthed the remains of unusually large wooden monuments near a pre-Viking Age burial ground. As archaeologists dug in preparation for a new railway line, they found traces of two rows of wooden pillars in Old Uppsala, an ancient pagan religious center. One stretched about 1,000 yards (1 kilometer) and the other was half as long. Archaeologist Lena Beronius-Jorpeland said the colonnades were likely from the 5th century but their purpose is unclear. She called it Sweden's largest Iron Age construction and said the geometrical structure is unique. 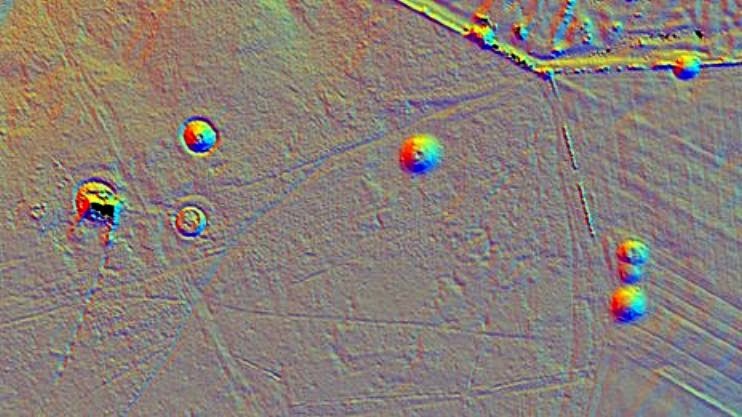 "It is a completely straight line and they have dug postholes every 20 feet (6 meters)," she said. "They have had an idea of exactly where this line is going and where to build it. It is a fairly modern way of thinking and we don't have many traces of these sorts of constructions from that time." 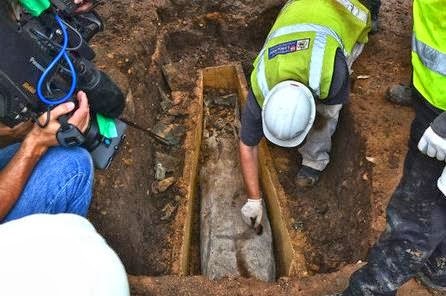 The mysterious lead coffin found yards from the grave of Richard III has delivered another twist in the tale of the Greyfriars excavation. Archaeologists had thought the 600-year-old metal casket, which was found in a stone tomb at Greyfriars in August, might belong to knight Sir William de Moton. The University of Leicester team – which uncovered Richard III a year earlier – also identified two other potential candidates, in Peter Swynsfeld, who died in 1272, and William of Nottingham, who died in 1330 – both former leaders of the Franciscan friars. A study on a Jersey site that revealed a significant piece of late Neanderthal history has been published. 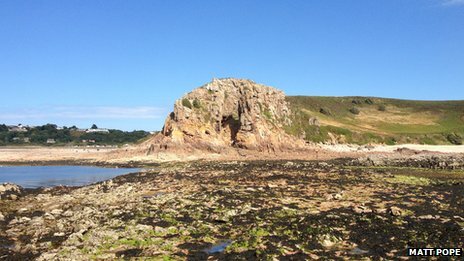 Scientists working on an archaeological dig in St Brelade said teeth found at La Cotte suggest Jersey was one of the last places Neanderthals lived. The team of British archaeologists have unearthed items which show the presence of Stone Age hunters at the headland. They said the finds were helping scientists understand more about the early relatives of modern humans. The latest property of choice for holiday home buyers in Southern Italy is not a rustic villa or a rambling farmhouse - it is a former farmer's shed, which would not look out of place on the set of Lord of the Rings. 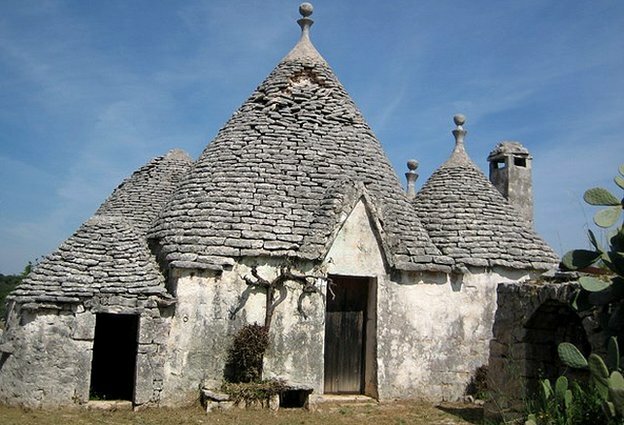 Trulli are the trademark of Puglia - existing nowhere but the Valley of Itria. Round limestone buildings with conical roofs, they are as magical as they are historical. Dotted across the landscape, alone or in clusters, with one cone or even a dozen, they look like miniature rustic fairytale castles - Asterix meets Disney. Originally nothing more than farmers' sheds used to store equipment or animals, the structure is made with the same drystone technique as the low walls that demarcate the olive groves. No cement, just local limestone cut into large, heavy slabs called chiancarelle - carefully positioned to make the perfect water-tight structure. 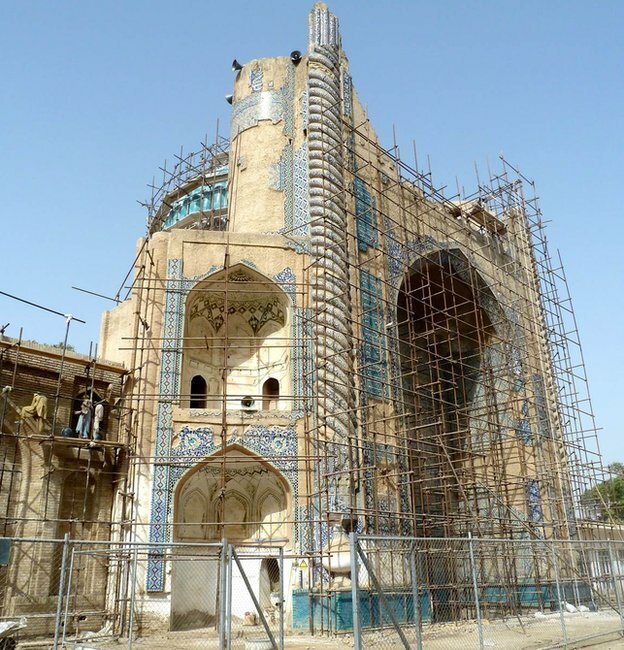 Balkh province in northern Afghanistan is home to some of the most significant historical sites in the world - its ancient city was even known as the mother of all cities. More than a decade after her first visit, Lynne O'Donnell returns with a group of archaeologists, trying to uncover more of its treasures. Across the far northern Afghan plain, a hot wind blows the dun-coloured dust into blinding clouds, and the women's burkas into blue billows. It is 40C in the shade, and even the small black goats being herded through the sand dunes look sapped by the heat. Archaeologists digging in old Uppsala have discovered what appears to be a remarkable display of power of a fifth century Swedish chieftain. Massive posts marked the ancient road in perfect alignment for more than a kilometre. "It's exciting because we’ve never seen anything like it in these parts before," Robin Lucas, archaeologist at Uppland Museum, told The Local. The archaeologists, who were excavating the area in preparation for a new railroad line, discovered 144 post-holes two metres wide and a metre deep in a perfectly straight line spanning a kilometre in Old Uppsala. The post holes are placed precisely six metres from each other. 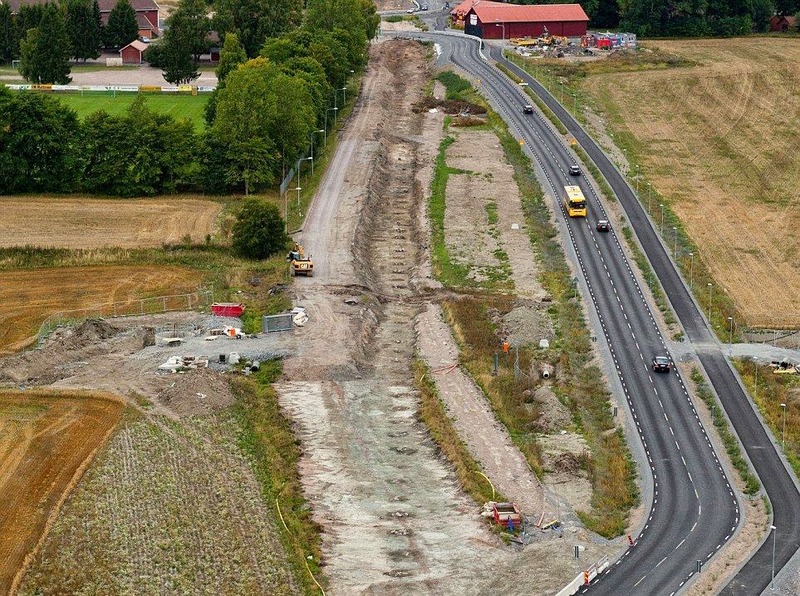 "It appears to be a processional road leading to Old Uppsala, which was the seat of the early Swedish kings," Lucas said. The remains of what is believed to be a 2,000-year-old Roman villa have been discovered near Devizes in Wiltshire. Archaeologists uncovered the remains on land near Lay Wood, between the Kennet and Avon Canal and Horton Road, as part of a survey ahead of a new housing development. Wessex Archaeology is now examining what has been found. Steve Melligan, from the Crown Estate, which manages the land, said it was an "exciting find". Removing food scraps trapped between the teeth one of the most common functions of using toothpicks, thus contributing to our oral hygiene. This habit is documented in the genus Homo, as early as Homo habilis, a species that lived between 1.9 and 1.6 million years ago. New research based on the Cova Foradà Neanderthal fossil shows that this hominid also used toothpicks to mitigate pain caused by oral diseases such as inflammation of the gums (periodontal disease). It is the oldest documented case of palliative treatment of dental disease done with this tool. This research is based on toothpicking marks on the Neanderthal teeth related to periodontal disease. The chronology of the fossil is not clear, but the fossil remains were associated with a Neanderthal Mousterian lithic industry (about 150,000 to 50,000 years). Last year, the ITV television series Britain’s Secret Treasures was a welcome hit, averaging 3.5 million viewers every evening for six programmes over the course of a week. It featured stories about 50 archaeological finds made by members of the public throughout Britain. The majority of the finds had either been recorded with the Portable Antiquities Scheme (PAS) or reported as ‘Treasure’ under the Treasure Act 1996 (or both!). The series culminated with the story of the Happisburgh Handaxe, a discovery which eventually led to the understanding that humans have inhabited Britain for hundreds of thousands of years longer than previously thought. Amateur cavers have discovered a network of tunnels underneath the Villa Adriana (Hadrian’s Villa) at Tivoli, near Rome. Experts suggest that the subterranean world of tunnels and roads was used to house slaves, oxen, carts and food supplies. The network includes streets wide enough to allow for the passage of carts in both directions as well as narrow passageways. Hadrian’s Villa covers approximately 618 acres but the extent of the underground network is not known yet and excavations are ongoing. The Roman Emperor Hadrian built the villa as a summer retreat between 38 AD and 118 AD. After his death in 138 AD, his successors used and enlarged the complex. 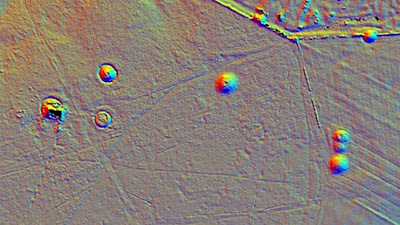 A decade ago, experts realised that there were tunnels beneath the complex, and a team of Italian archaeo-speleologists led by amateur caver Marco Placidi mapped more than a mile of the vast network this year. Recently , we shared with you some recent discoveries in Romania, from various periods. Apparently there is room for more, as the biggest house from the pre-Cucuteni period, 5200-5100 BC was just found in Baia, Suceava. Experts from the Cambridge University support this research, seeking to identify how the grain trade between China and Europe was made at that time. The discovery is extremely important, as it confirms the existence of the pre-Cucuteni first phase. 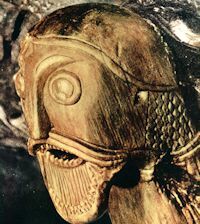 A similar archaeological discovery, from the same period, was made in 1951. Emil Ursu, Bucovina’s Museum Director, said that the site will be dated using Carbon 14 into a laboratory in Germany. We may have to change some thinking about early human evolution in a major way, suggests researchers, after studying new fossil finds at the site of Dmanisi in the Republic of Georgia. What has previously been thought to be separate ancient human species - Homo erectus,Homo habilis, Homo rudolfensis, and Homo ergaster, for example, may actually be variations of one and the same species. This is the conclusion of a recent examination of fossil finds uncovered at this, the world's earliest known hominid site outside of Africa. The new report describes the analysis of a complete, approximately 1.8-million-year-old cranium that was discovered in 2005 by scientists who, 5 years earlier, uncovered its corresponding mandible (jaw) at the same location. Combined, these fossils now constitute the most complete adult ancient human ancestor skull known to be identified with the Early Pleistocene genus of Homo (the genus of great apes that includes modern humans and species closely related to them). The Early Pleistocene time period ranged between 2.588 ± 0.005 Ma (million years ago) and 0.781 ± 0.005 Ma. In this photo taken Oct. 2, 2013, in Tbilisi, Georgia, David Lordkipanidze, director of the Georgia National Museum, holds a pre-human skull found in 2005 in the ground at the medieval village Dmanisi, Georgia. The discovery of a 1.8-million-year-old skull of a human ancestor buried under a medieval Georgian village provides a vivid picture of early evolution and indicates our family tree may have fewer branches than some believe, scientists say. The fossil is the most complete pre-human skull uncovered. With other partial remains previously found at the rural site, it gives researchers the earliest evidence of human ancestors moving out of Africa and spreading north to the rest of the world, according to a study published Thursday in the journal Science. The skull and other remains offer a glimpse of a population of pre-humans of various sizes living at the same time—something that scientists had not seen before for such an ancient era. This diversity bolsters one of two competing theories about the way our early ancestors evolved, spreading out more like a tree than a bush. 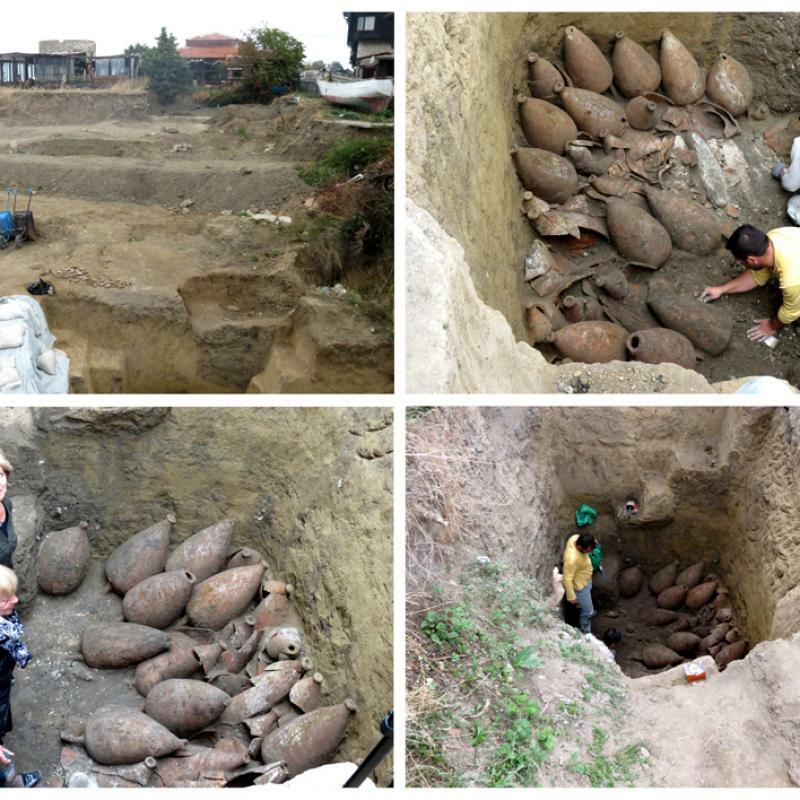 A team of archaeologists, headed by Associate Professor Aneliya Bozhkova with the National Archaeological Institute with Museum with the Bulgarian Academy of Science, and Petya Kiyashkina with the Ancient Nesebar Museum, discovered a perfectly preserved cellar with amphorae from the V BC, over the last days of the archaeological excavations in the Bulgarian coastal town of Nesebar, the press office of Nesebar Municipality announced. The research is organised under a project of the Ancient Nesebar Museum, financed by the Ministry of Culture, with the participation of experts in archaeology. The ancient amphorae warehouse was dug in deep into the ground along the northern coast of the peninsula, which preserved it from the encroachment of time and the following cultural layers. It's cold. It's silent. It's murky. It's the bottom of the Mediterranean Sea and it's the hangout of choice for students of maritime archaeology, seeking clues to the dawn of modern man. 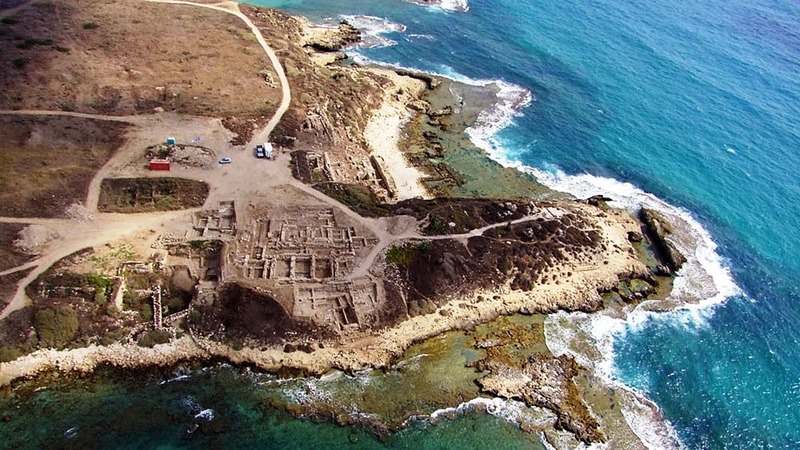 Or in the case of participants on Haifa University’s new English MA in Maritime Civilizations, signs of a harbor at the ancient site of Tel Dor. The Tel Dor expedition, some 30 kilometers south of Haifa, is a collaboration between Dr. Assaf Yasur-Landau and Dr. Ayelet Gilboa of the University of Haifa, and Prof. Ilan Sharon of the Hebrew University. Students of the new English-language program, which started its second year this fall, take part in underwater surveys of Tel Dor mostly in shallow waters but also at depths of up to 10 meters of water. Roman ruins are rarely boisterous places, full of noise, laughter and life. But Edward Lewis stumbled across one that is - a place to have a daily wash, and to enjoy the companionship of friends, just as it was for the Romans who built it. Observing middle-aged men swathed in white foamy soapsuds is not something I would normally write home about and it certainly wasn't why I was in north-east Algeria. I had come to look at the Roman baths in Khenchela and had overlooked the fact that for many of the local population the attraction was not the ancient architecture or remarkable state of preservation but the fact there was a free and plentiful supply of hot water - still feeding into two open air baths. Peter Steen Henriksen and Sandie Holst excavate Denmark's oldest lime kiln. Photo: National Museum. It was already known that Iron Age Danes whitewashed their houses and halls with lime to protect clay walls against wind and weather. However it wasn’t clear whether they created their their own lime, or if it was sourced from elsewhere. Now Danish National Museum archaeologists have found the answer in the rich Viking settlement at Tissø, Zealand. 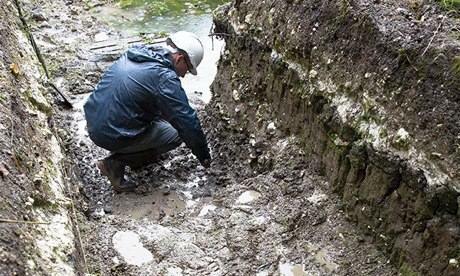 In the spring of 2013 they excavated the first lime kiln from the Danish Late Iron Age, the oldest found in Denmark. The researchers examined a kiln used to burn slaked lime around the the middle of 800s CE. National Museum archaeologist Sandie Holst explained that, “We knew in advance that the great halls and buildings of Fuglede farmhouse were whitewashed because of previously excavated daub with traces of white chalk, but now we have proof that the limestone was burned in the immediate area” . If you're French, asseyez-vous, s'il vous plait. Archaeologists digging about a mile away from Stonehenge have made a discovery that appears to overturn centuries of received wisdom: frogs' legs were an English delicacy around eight millennia before becoming a French one. The shock revelation was made public on Tuesday by a team which has been digging at a site known as Blick Mead, near Amesbury in Wiltshire. Team leader David Jacques said: "We were completely taken aback." In April they discovered charred bones of a small animal, and, following assessment by the Natural History Museum, it has been confirmed that there is evidence the toad bones were cooked and eaten. "They would have definitely eaten the leg because it would have been quite big and juicy," said Jacques. IT IS a discovery which ranks as one of the most treasured finds to be unearthed yet in an archaeological dig spanning more than a decade. Archaeologists carried out initial investigations at the Hungate site in the centre of York at the turn of the Millennium, but have only now managed to pinpoint the location of a forgotten church which gives a fascinating insight into life during the medieval era. 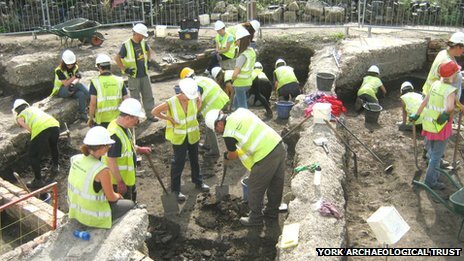 The remains of the Church of St John The Baptist, more commonly known as St John’s in the Marsh, have been found as part of the most extensive dig that York has seen since the early 1980s ahead of a £150m housing and retail development. The OUDCE is sponsoring an annual lecture on landscape archaeology in memory of Mick Aston, who sadly died earlier this year. Mick was tutor in local studies in the Department for Continuing Education before moving to Bristol University as Staff Tutor in Archaeology. Earlier he had made a major contribution to the archaeology of Oxfordshire through his work on the Sites and Monuments Record, then based at the City and Count Museum, Woodstock. In this lecture Trevor will discuss the thinking behind Landscape Archaeology, a book which went on to have a significant impact on the development of field archaeology in Britain. s part of a larger pan-European study investigating the Bronze Age of Europe, an archaeologist from the University of Gothenburg has provided the first evidence of long distance travel by an individual – probably from southern Sweden – into the territory of the Únětice culture of Silesia. The doctoral thesis confirms evidence based on bioarchaeological data. ‘Over 3800 years ago, a young male, possibly born in Skåne, made a journey of over 900 kilometres south, to Wroclaw in Poland”. concludes Dalia Pokutta, author of the thesis. He met his end violently in Wroclaw, killed in the territory of the Úněticean farmers. His remains were discovered in association with two local females, who had been killed at the same time. A group of archaeologists is undertaking a major dig in Wiltshire, which it is hoped could explain why Stonehenge was built where it was. The team, which consists of leading experts in the Mesolithic period, also hopes to confirm Amesbury as the oldest continuous settlement in the UK. 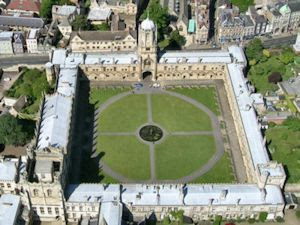 The site already boasts the biggest collection of flints and cooked animal bones in north-western Europe. 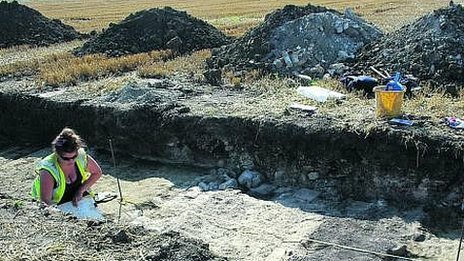 The barracks occupied by the 8th Roman legion of Augustus in the middle of the 1st century AD have been discovered by a team of researchers from the Antiquity of Southeastern Europe Research Centre, University of Warsaw, during the excavation in Novae near Svishtov, Bulgaria. "The structure consisted of a series of segments of equal sizes. The segments consisted of one big and one small room, the dimensions of which underwent modifications in the subsequent phases of the settlement. The barrack was about 16 meters wide and 42 meters long" - explained Prof. Piotr Dyczek , head of the expedition. The remains indicate that the support structure were large wooden poles, while smaller dowels sustained braid covered with soil. In the last phase, the exterior walls were covered with white plaster. The system of small dowels inside large rooms suggests, according to the researchers, that there could be bunk beds in the corners. There were wooden shelves in the vestibules. 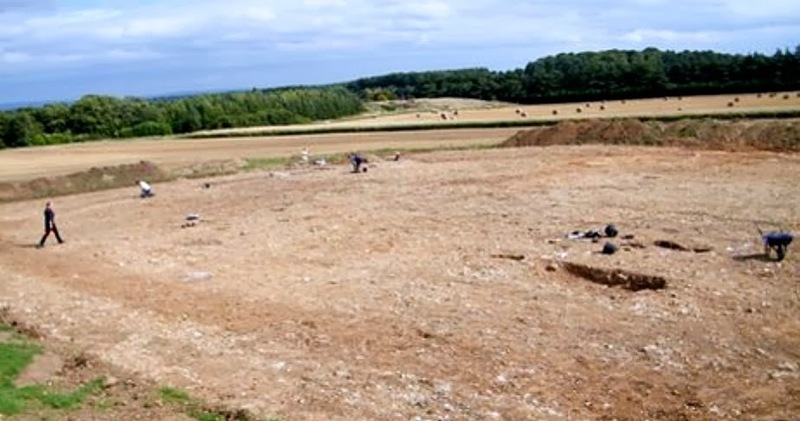 Archaeologists have unearthed an Iron Age enclosure while excavating land at the edge of a working quarry. 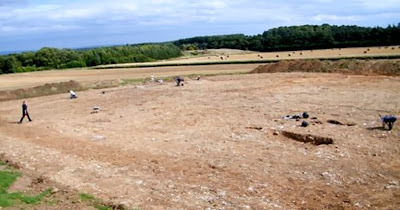 It is thought the encampment discovered at Potgate Quarry, near Ripon, was home to several families from as early as 130BC before being abandoned. Dig leader Steve Timms said the site was later brought back into use in the early Roman period as a paddock. The findings by an international team have beenpublished in Science journal. Austrian scientists have found that 19 Tyrolean men alive today are related to Oetzi the Iceman, whose 5,300-year-old frozen body was found in the Alps. Their relationship was established through DNA analysis by scientists from the Institute of Legal Medicine at Innsbruck Medical University. The men have not been told about their connection to Oetzi. The DNA tests were taken from blood donors in Tyrol. Archaeologists in northern Sweden have located the remains of a farm from the Bronze Age, a find which challenges the established history of the area around Umeå and the province of Norrland. "It is completely unique," Jan Heinerud at Västerbotten's Museum in Umeå told The Local on Friday. "We have never previously found a long house like this so far north." The farm was discovered in the area between Backen and Klabböle in an area known as Klockaråkern and it is thought that the farm was in use for almost 600 years from around 1100 BC. Two penises engraved on a 2,000 year old stone may shed light on the foundation of the city of Aosta in northern Italy, revealing its deep connection with the Roman emperor Augustus. Named Augusta Praetoria Salassorum by the Romans -- who captured it from the local Salassi people in 25 B.C. to control strategic mountain passes -- Aosta boasts several monuments dedicated to Augustus.